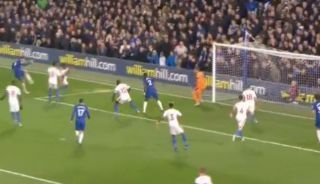 Alvaro Morata scored a fine left-footed volley for Chelsea this evening to give the Blues the lead in their clash against Crystal Palace at Stamford Bridge. The Spaniard, who originally opened the scoring for the home side, fired him a volley with his week foot from a tight angle following a cross from substitute Eden Hazard. This goal will surely do wonders for Morata’s confidence now, as he has four goals in his four last Premier League games following this class strike. Here’s a clip of Morata’s finish this afternoon. Great comp0sure to hit that in with his left!